For marinade: Combine pineapple juice, onion, liqueur, rum, honey, pepper sauce, garlic, salt, nutmeg, and curry powder in a medium sized bowl. Marinate the ribs overnight in the marinade. Preheat oven to 300°F. Place the ribs and marinade in a roasting pan and cover with foil. Bake in the oven until tender. Remove the ribs from the oven and drain the liquid into a sauce pan. Bring to a boil over medium high heat and reduce until the liquid thickens. This will be used to glaze the ribs on the barbeque. Heat a barbeque to medium heat. Grill the ribs on both sides until golden brown and brush with the reduced liquid to glaze. 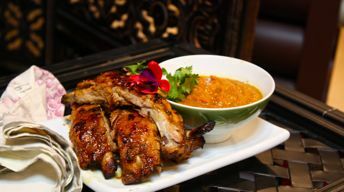 Serve with Mango barbeque sauce. Combine all ingredients in a saucepan. Cook over medium heat, stirring occasionally and cooking until the mixture attains a jam like consistency. Cool to room temperature and puree in a blender or food processor until smooth. Adjust seasonings to taste. Serve with the Caribbean Barbeque Ribs.